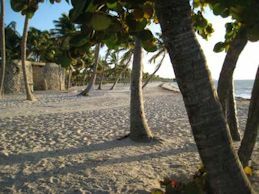 How far is your Key West Vacation Rental from the beach? borders (steps away) the biggest and best beach in Key West, Smather's Beach. We supply the beach towels and a few basic swim toys such as noodles. You will be ableto rent beach chairs on Smathers beach if you need a beach chair. How far is your Key West condo rental from the Airport? Our condo rental is located about 1.6 miles from the Key West International Airport. How far is Key West from the Miami Airport? Key West is approximately a 3 1/2 hour drive from the Miami airport and a four hour drive from the Fort Lauderdale airport. The drive will seem to go by much quicker due to the fantastic scenery that you will see. How far is your 1800 Atlantic resort accommodation from Duval Street? Our vacation rental is approx. 1.4 miles from the southern end of Duval St.
What are your hours of check in? Normal check in hours for our vacation rental is from 9:00 am to 5:00 pm weekdays and 1:00 to 5:00 pm on Saturdays. Guests should check in at the All Florida Keys Property Management Office which is located a few blocks from our resort at 1223 White St., Unit 102. After regular business hours (9:00 to 5:00) & Sundays or holidays guests may check in at the west entrance to our resort property. Our 24 hour security personal will assist you with your check you in after normal business hours. You must call however to make these arrangements with our property manager prior to your arrival by calling (800) 433-2819. You must be pre-paid for after hour check-ins. Is it possible to check in early or to check out late? Check out time is 10:00 am. & check in time is 4:00 pm. We do the best we can to take accommodate our guests. Due to our cleaning service we can't guarantee an early check in. We have an additional charge of $25 per hour for checkouts after 10:00 due to our cleaning service contract. Do you have any age restrictions to rent your condo? Is Transportation available at your Resort? The nearest public bus stop is located three blocks from out location at Flagler St. There are cabs available 24/7 which are reasonable due to the close proximity of the islands attractions. Many guests will make arrangements to rent bikes for their stay which we recommend. Most Key West bicycle rental companies will deliver free right to our Key West condo rental. The bikes can be stored in our assigned parking area in the gated garage area. What is the maximum number of guests for your vacation rental property? Six guests is the maximum allowed by our condo association for our two bedroom condo rentals. Three bed condo rentals may have a maximum of eight people. What size beds does your Key West home rental come with? Both our condo's bedrooms come with king sized beds and our living room pullout sleeper sofa is queen size. Is your condo rental handicap accessible? Our 1800 Atlantic resort is equipped with elevators which will accommodate wheelchair access. We do not have special handicap handles or supports in the bathrooms. The master shower has a six inch lip that requires a wheel chair to be lifted over to access the shower area. Which floor is your vacation rental condo located on? Our condo is located on the second floor of a three floor building. Our condo features a fantastic tropical garden view from our private balcony. Does your resort have a Bar/Restaurant? We do not have an onsite restaurant or bar. We do have three restaurant/bars within a few minutes walk from our 1800 Atlantic resort. Can we rent your vacation rental condo for just one Night? Our vacation rentals have a minimum stay of three nights. The exception would be a two night stay if we only have two nights in a row available on our availability calendar. What do we need to pack when we rent your condo? Does your Key West resort have parking and is there a charge? Our Key West condo rental comes with one assigned, secure and covered parking space. Parking is free of charge. Our resort also has a general parking lot for overflow parking. Our resort unfortunately does not allow RV's or boat and wave runner trailers. Is there internet access with your vacation rental condo? As an added bonus to our guests, we have high-speed wireless internet access available at No-Charge! Hotels will charge per day for this feature. Are roll-away beds, cribs or high chairs available for rent? You can make arrangements to rent extra beds, cribs or highchairs for your stay. Our management team will take care of any details. Please notify them of your request when making payment arrangements.